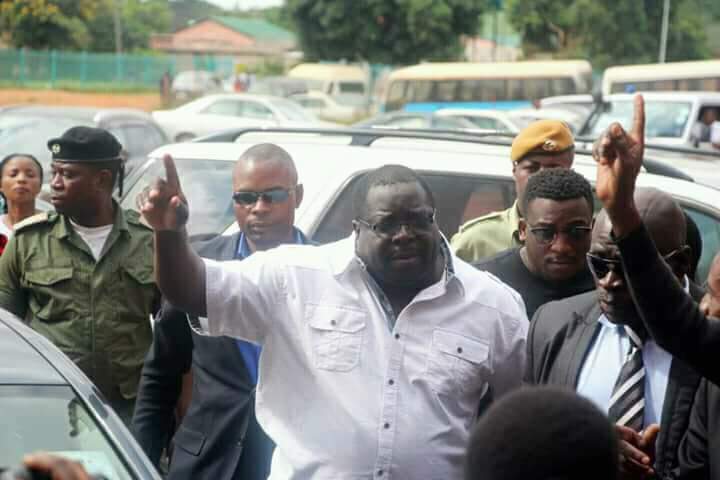 NDC shadow leader Chishimba Kambwili has vowed that he will not give up fighting to liberate the country from what he calls an illegitimate regime of President Edgar Lungu. And Kambwili who last week toasted between hospitals and police following his arrest says he is ready to die for the country if that is the price to liberate the country from PF government. Meanwhile Kambwili apologised again for the people he injured knowingly or unknowingly while he served under PF and Edgar Lungu. Kambwili now says it is the most painful thing to think on how he defended Edgar Lungu’s PF in the two previous elections. Kambwili who is Roan constituency Member of Parliament stated this in a statement below Tuesday, 3rd April 2018. By the grace of God, l finally managed to secure my bail after many hurdles which were well orchestrated by the powers that be. Obviously, this comes after a very painful, stressful, and torturous period of legal battles waged by my dedicated team of lawyers and several political leaders who stood by me in solidarity. I am deeply honored and indebted to all my brothers and sisters in the opposition, members of civil society, the Church and many other stakeholders and citizens that stood with me right from the first day this deliberate and outright abuse of the law by state institutions and authority began. My personal humiliation and persecution, together with that of other progressive political leaders and cadres across the country serves as a reminder to all of us that we are living under a frightened, evil and despotic regime, which is determined to paint decent and innocent citizens as “criminals”. Judging from my recent experiences, I implore all progressive political formations in this country not to underrate this regime’s capacity to commit worse atrocities. There is no doubt in my mind that tough times lie ahead but I believe in our common resolve to overcome sooner rather than later. This regime is panicking because they have realized that whilst their time is up, their crimes of yesterday, today and tomorrow pose a greatest threat to their looting of the state treasury, livelihoods and comfort beyond their tenure of office hence these cruel manoeuvres and thirst for innocent people’s blood. But it shall not work because the God who reigns over Zambia will emerge supreme very soon. It is very clear that President Lungu has become increasingly paranoid and desperate. I think it is related to the fact that he has no programme or agenda, so he is instead preoccupied with threats, real or imagined, to his illegitimate power. Ironically then, his heavy-handed crackdowns on political opponents and a failure to offer voters anything positive only causes his opponents to multiply. Look at their reaction to the launch of the Socialist Party. Their expulsion of the Cuban Ambassador to Zambia simply shows their fear of the coming of Fred M’membe and other critical voices onto the political scene. This is driving them mad. I welcome the Socialist Party in this battle for a better Zambia. During my humiliation and persecution in the past days, I have gone through a period of intense reflection and soul searching and what comes out prominently is the fact that I need to make it right once more with my brothers and sisters I might have injured in the course of my political activities in the recent past. I must admit that nothing surpasses the pain and regret of realizing that President Edgar Chagwa Lungu’s mediocrity is what I defended and risked my life for in the last two Presidential elections. To all those I injured whether knowingly or unknowingly, I sincerely and wholeheartedly apologize and please let love lead. However, my personal humiliation and persecution has cemented my resolve to boldly demobilize this “monster” I helped create after the demise of Mr. Michael Chilufya Sata (MHSRIP). For the sake of the country and it’s people, I am more resolved now than ever before to see to it that state power and its accompanying responsibilities is democratically taken away from the hands of these desperate, thieving, heartless and sadistic people. This country deserves better and certainly what we have today is not even an inch closer to what can be termed as sensible and credible leadership. This corrupt mob which is currently governing our country must be shown the real potential that lies in unity of purpose amongst God’s people. They must be shown the unconquerable spirit of God’s people in extricating themselves from tyranny and ungodly leadership which has turned ordinary citizens into individuals treated like hostile foreigners in their own country. Once again, I thank you for your prayers and support fellow country men and women. In all this, I owe my life to the people of Zambia and if my life will be the last thing President Lungu will take away from me to quench his savagery and decadent desires, so be it. I am ready to pay the ultimate price for my country and for posterity’s sake. God bless the Republic of Zambia. Lungu is a satanist. You can see this clearly by his deeds. Yenda ufentele kutali uko nachimimba chako iwe! Imbwili ikatweba how 2016 elections were rigged. We are waiting. You are very correct.We are just waiting for that time and it is very soon. Bwana Kamwili,the charges you are facing have nothing to do with politics.The 37 charges you are facing and which keep you fainting whenever ACC WANT YOU TO FACE COURT are due to your alleged stealing from Zambians.If you have love for Zambians,return the LOOT to the owners whom you mock by saying you are prepared to die for Zambians.How can you justify this? There was NO rigging you just lost.